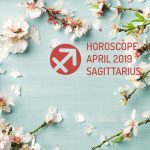 Here is your Sagittarius Horoscope for April 2019. Every month, you will find at WeMystic the astrological forecasts for your zodiac sign. The beginning of the retrogradation of Ceres and Jupiter in Sagittarius (the days 09 and 10/04), can upset the mood of the natives of Sagittarius, increasing the tendency to pessimism and the need for solitude. However, this does not rule out that April 2019, will be a favorable season in romantic matters. For singles, Mercury’s entry into House V of Sagittarius (17/04) will present the opportunity to interact with people who arouse romantic and sexual interest. As the asteroid Vesta and Venus will also transit on this sector of the astral map (House V), from 03 and 20/04, the subject will seek the closeness of those with whom he feels not only attraction, also spiritual affinity. It is worth noting that the New Moon in Aries on 05/04, will also touch the House V of Sagittarius, which translates into the possibility of starting a romance, a pregnancy, or a special creative project. On the other hand, Mars remains in House VII of Sagittarius, indicating that the native needs to feel in control of the relationship. However, it is important to remember the need of the other to be heard. In this sense, Juno’s entry into House VIII of Sagittarius (20/04) is beneficial, since it refers to the commitment assumed with the partner, the increase in trust and responsibilities. Romantic walks in places close to the habitual residence will be well looked during this season, and can encourage the connection of the Sagittarians with their own sensibility (Psyche in House III). Important: in April 2019 begins a significant period to consciously work on self-love, due to the retrogradation of Pluto and Saturn in House II of Sagittarius (from 24 and 29/04). April 2019 can be a confusing financial period for Sagittarius’ sons and daughters. The beginning of retrogradation of Pluto and Saturn in House II of the sign (on 24 and 29/04, respectively), impose an exhaustive review of the economic processes. Let us remember that currently in House II of Sagittarius, there is the South Node (that which must be overcome in the present existence), which, together with the retrogradation of Pluto and Saturn, puts in evidence the patterns that attempt against the financial and emotional security of the individual. In this sense, obsolete resource management structures are manifested; fear of economic loss or source of income; abuse of personal power; and the repetition of situations, which sabotage the consolidation of material objectives. The entry of asteroid Juno in House VIII d Sagittarius (20/04), indicates that you have the support of family, partner or couple to overcome this trance, and your confidence will be strengthened, as part of the circumstances. Keep in mind that committing to others, for common objectives in the medium and long term, does not imply losing your independence and freedom of action, but discovering another path of growth, through dedication and faith. In the work environment, the entry of the Sun in House VI of Sagittarius (20/04) constitutes a promising planetary movement for the natives of the sign, especially for those who want to stand out at work. However, don’t forget that although assuming new responsibilities does not imply a higher salary (Pluto and Saturn retrograde in House II), it does prepare you for the future and contribute to your professional growth. The Sun in House VI of Sagittarius points out valuable opportunities in this sense. Similarly, the New Moon in Aries on 05/04 will touch House V of Sagittarius, announcing an important peak of creativity, and the development of new projects, which require your particular skills. Since Mercury and Venus will also be transiting over the Centaur’s House V (April 17 and 20, respectively), it is suggested that although there will be different options, you should choose the one that really awakens your interest and is aligned with the desires of the soul. Another relevant astrological aspect, during this period of the year, is the Double Full Moon in Libra, which will take place on 19 April and will affect the House XI of Sagittarius, where the retrogradation of the asteroid Pallas takes place. The apparent regression of Pallas suggests disorganization when dealing with groups (colleagues, friends, subordinates), but with the Double Full Moon in Libra you will become aware of how to adjust your approach, with the aim of obtaining better interaction from third parties. The physical state of the Sagittarius natives will have a positive balance, during April 2019. The entrance of the Sun in the House VI of the sign (20/04) will be a valuable ally for those who are going through processes of recovery and convalescence. Likewise, this planetary position (Sun in House VI of Sagittarius) favors the determination to meet proposed objectives, such as continuing a routine of exercises, avoiding relapse into a harmful habit, and incorporate new flavors and natural foods to the food plan. However, it is important to bear in mind that Ceres and Jupiter will begin their apparent retreat phase in Sagittarius on 9 and 10 April, respectively. Retrograde Ceres in Sagittarius can be interpreted as the search for solitude; a certain rejection of the company of beloved Ceres, or of transmitting knowledge; intolerance and critical (excessive) judgment. If you focus from the positive point of view, the retrogradation of Ceres in Sagittarius is the opportunity to evaluate your own beliefs, philosophy of life, and what is your contribution to the people around you (family, partner, colleagues, friends, and community). On the other hand, retrograde Jupiter in Sagittarius refers to inner expansion, examining self-imposed blockages and old value judgments, which are interfering with the full enjoyment of the present. In low vibration, Jupiter retrograde in Sagittarius can induce waste and excesses in food, beverages and shopping. Likewise, the subject may be extremely generous or stingy with loved ones, trying to compensate or teach them “something”. Share experience and learning, not judgment. Moderation and tolerance will be the key to dealing with this kind of trend.